This article first appeared in the Bradford Era on May 19, 2017. On any given Sunday, needy people stop by the Episcopal Church of the Ascension on Chautauqua Place in Bradford with the hope there will be food to spare. Consequently, when the Rev. Stacey Fussell, rector of Ascension, learned Amanda Kemick and Stacy Wallace needed a venue for their new Blessing Box, she volunteered outdoor space at the church for the project. The Blessing Box, which was installed near the church parking lot on Mother’s Day, sits atop a pole several feet high. Inside the unlocked box are canned and boxed foods stocked by parishioners and community residents. All food items in the box are free for the taking. Kemick, a stay-at-home mom, said she and Wallace, an attorney, came up with the Blessing Box idea last fall after viewing a post on Facebook. “Many of our friends on Facebook expressed interest and support of the idea,” Kemick recalled. “We began with the construction of two boxes” after funding was provided by two private donors. Kemick said they contacted Scott Oxley, carpentry teacher at Bradford Area High School, for help. When they asked Oxley if the students could construct two boxes similar to what was seen online, he agreed and asked only that materials be provided. The first box was installed Sunday at the church by Kemick and Wallace’s husbands, Donny and Curt, respectively. She said the blessing box is not limited to food, as donations of personal hygiene items and baby products are also acceptable. In explaining the notion behind the blessing box, Wallace said it is intended to bless all people with food and items, regardless of class. “I know some people do not want to take something for nothing, so if you see something there you need, take it and put something else in — like a barter system,” Wallace explained. She said the hope is the boxes will be replenished by the community. As a backup measure, one or two groups from the community will be assigned to stock the boxes, as needed. Suggested store-bought items for the box include canned foods, dry cereal or other dry items such as pasta and rice. Small clothing items that include new packages of underwear, socks or gloves, are also acceptable donations. Fussell said initial food items stocked in the box, that included small canned hams, were taken. They were quickly replenished with other food, however. She said the supplies will likely be appreciated by people in the neighborhood which is close to housing projects. “From our standpoint, it is not uncommon to have folks come by the church on a Sunday afternoon and say ‘I don’t have any food in my house,’” Fussell remarked. “Ascension doesn’t keep a stocked food pantry” and none of the other pantries are open on Sunday. In making a final comment, Kemick said their greatest hope is that by next winter a local agency or private business will offer to house a blessing box inside its doors. 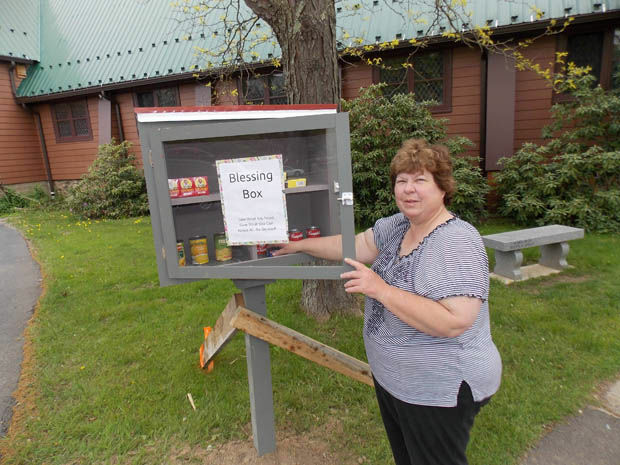 “Our outdoor blessing boxes will get less use in the winter due to foot traffic and the practicality of food storage, yet we could use blessings year round,” she said. Kemick said there is another blessing box ready to be installed, but a location hasn’t been determined. She said a church or organization that can ensure the box will stay filled would be preferable. Kemick said they have plans to make additional boxes in the future. For more information on the blessing boxes, contact Kemick or Wallace via Facebook or call Wallace at Hamlin Bank and Trust Company at 887-5555. Ever since Paul wrote to the Thessalonians to “pray without ceasing” (1Thess 5:17), I think followers of Jesus have internalized some sort of guilt that we aren’t praying enough. I’ve never met a Christian who felt like they had mastered a really great prayer life, much less one that could confidently say that they prayed without ceasing. I think many of us feel like prayer-failures because we have set ideas of how we ought to be praying and find ourselves always falling short. My grandparents sat every morning of the world together after breakfast and had their ‘devotional’ time. Papaw would read assigned scripture and a reflection from Guidepost Magazine; Mamaw would name off the missionaries to be prayed for and tell their story from the Baptist Ladies Missionary Aid Society. Then Papaw would commence to praying for everyone and everything he knew and loved, especially that we grandchildren would all come to a saving knowledge of Jesus. It didn’t even strike me odd at the time that he prayed for my salvation right alongside his tomato crop. As I became more serious about living out my own faith, I wanted to get more serious about prayer. I decided to emulate my grandparents and set aside morning time to pray, but I never seemed to have the time. Then I committed to getting up extra-early every morning to read the Bible and say prayers – which worked just about as well as my commitment to get up extra-early to go to the gym did. The truth is, my prayer personality is not the same as my grandparents. Yours probably isn’t the same as mine. Instead of beating ourselves up because we can’t seem to succeed at praying in a certain way, how about we explore what way of praying works for us? That’s what I did. 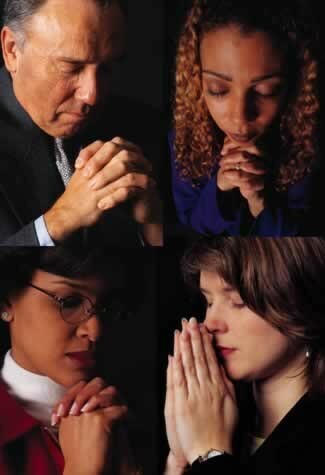 When I lived in Houston and regularly had an hour commute each morning, drive time was prayer time. As a mother with small children, God got a quick hello during my morning shower and I did my real praying at bedtime, just like my kids. Yes, sometimes I fell asleep before I got through all the God blesses, but I figured God understood. If you are committed to improving your prayer life, you can do it. You can find what and when and how works for you. If you take morning showers, review the day ahead, intentionally asking God to be in it and bless it. Sing a favorite hymn of praise, even. That’s prayer, too. If you have a quiet time in the morning or at lunch or in the evening, set aside 20 minutes to read the daily office from the Book of Common Prayer. There are even apps available on your phone with the set scriptures for the day. I don’t say the office at the same time every day, but I almost always get it said. Waiting in a pickup line for kids, or at the doctor’s office or where ever, you can do it. Give thanks before each meal where ever you eat it – it takes 30 seconds and saying ‘God is good, God is great’ is fine. As you lay down to sleep each night, thank God for the blessings of the day and try to leave your worries in heaven to be sorted out. This is the fourth installment in our Prayer series that will run up to the Diocesan Prayer Vigil in March. Click here to view other stories in the series, and here for more information on the Vigil. Reprinted from “Ascension Connection,” Ascension, Bradford’s monthly newsletter. It’s really silly of me to spend energy even considering the whole time change thing, since it is surely something I cannot do a thing about. When it comes to this issue, I can be a thermometer but not a thermostat – I can report what is but I can’t change it. There are other areas, however, where Cicero’s lament is still true where I can affect change. Consider the standards of our common life and interactions in general. It’s becoming harder and harder to distinguish between worldly values and practices and those of Christians and the Church. Standards like being faithful, being patient, being present are sometimes seen as antiquated and no longer realistic – even among Christians. The loss of these standards diminishes us and our society. Sadly, too many Christians seem to be content being thermometers – wringing their hands and exclaiming how awful it is. But we can be thermostats instead – not just reporting what is but also triggering action to change the environment where we find ourselves. In other words, we can be and live out the change we want to see and model a different way. This has direct implications for how we live as stewards of God’s gifts, too. Too many of us have adopted the world’s standards when it comes to giving – giving of time, talent and treasure when it is convenient, when we feel like it, when we have any extra. Does that sound like what Paul meant when he wrote to early believers, “on the first day of each one of you should set aside a sum of money in keeping with his income…” to give for the work of the church (1Cor 16:2)? The Bible tells us over and over that as followers of Jesus, we are being transformed and are to be about transforming the world for the sake of the Kingdom – to be salt, light, yeast. It seems that God expects us to be holy thermostats instead of thermometers. If enough of us respond, we really can change the world and that’s been God’ plan, all along.